Elizabeth Castaldo is an artist, printmaker, and bookbinder living and working in Montgomery, NY. She received her MFA from the Savannah College of Art and Design in Atlanta GA in 2013 where she was a Dean’s Fellow in Printmaking. 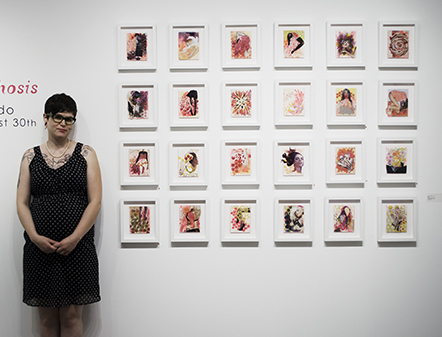 Castaldo received her BFA in Drawing and Painting in 2007 from the School of Visual Arts in New York, NY. Castaldo recently interned with Straw Hat Press, a professional contract printshop located at Atlanta’s Goat Farm Art Center. In her spare time she creates custom handbound sketchbooks under the moniker Bound Sweet & Simply Sewn. Castaldo has exhibited work throughout the United States as well as at the SCAD Lacoste campus in France. Castaldo received first place for her book Specimen in the 6th Annual Artists Book Competition at the ACA Library of SCAD, and her print Miss Winter (Juniper) received best in show in the “Sidewalk Art Project” exhibition at the Atlanta Preservation Center. In addition to being in many private collections, Castaldo’s work has been collected by the Savannah College of Art and Design and the SUNY Orange School of Nursing. I am currently engaged in an exploration of the human relationship with nature, a relationship that often feels disconnected due to technology and the artificiality of the post-modern world. These things make it easy to forget where we come from. However, the natural connection is undeniable when one looks at the structural patterns inherent in plant and animal life, including in humans. I am interested in exploring this mysterious connection in the context of the female body as a personification of nature. In my current body of work I am highlighting the conflict between contemporary humans and their disconnect from nature. The resulting work depicts figures that are involved in an unclear transformation. The bodies exist on the cusp of creation and destruction, drawing a parallel between the conflicts of the human mind, and the entropy of nature. The imagery lies in ambiguous space that contributes to a feeling of loss, self-destruction, and chaos, but ironically has an atmosphere of beauty. The duality serves to blur the lines between nature and body, and the deconstructed figures begin to transform into new awkward organisms with their own sense of sensuous beauty. The conflicts present in the subject matter create a push and pull between nature and human nature. In a series of small collages, I have culled imagery and ideas from my larger work, essentially creating studies. As part of my studio practice I moved back and forth between these smaller pieces and other bodies of work. The Collage Studies reveal the essence of my work in a more whimsical manner, and have given me the freedom to create quick playful pieces that are influenced by, and in turn influence, larger works.